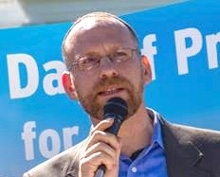 Rabbi Jason Kimelman-Block is the Director of Bend the Arc Jewish Action, where he works to bring the voices of progressive American Jews into the halls of power in Washington, D.C. He previously served as Bend the Arc’s Rabbi-in-Residence and directed the Selah Leadership Program. He is the co-editor and co-author of Just: Judaism. Action. Social Change and served as the Director of the PANIM Institute for Jewish Leadership and Values. He received his rabbinic ordination from The Jewish Theological Seminary of America and his B.A. in Political Science from Grinnell College. Rabbi Kimelman-Block is also a founding member of a cohousing community in Maryland, where he lives with his wife and their four children. As the Director of Bend the Arc Jewish Action PAC, Derek identifies federally elected officials and candidates who are in the best position to champion Bend the Arc Jewish Action’s legislative agenda and maximizes the PAC’s resources to support those candidates. Derek comes to Bend the Arc Jewish Action with an extensive background in political strategy and legislative advocacy. He has created and executed candidate campaigns, PAC strategy, and led movements from the bottom up as a community organizer. For the past four years, he has been working as an independent campaign consultant. Prior to that, Derek served as the Deputy Director for Campaign for America’s Future. His research has been published by several national think tanks and his written work has been featured on numerous media outlets. Derek is a graduate of Beloit College and the School of Professional & Extended Studies at American University. Originally from Cincinnati, Ohio, Derek has lived abroad in Singapore and Denmark. He has served as a LGBTQ Advisory Board Member for the DNC and a Board Member of the Jewish Community Relations Council of Kentucky. Bend the Arc Jewish Action PAC’s Leadership Committee ensures our endorsees have the resources they need to be voices for progress in Washington, D.C. Leadership Committee members are partners in developing the PAC’s strategy and commit to contributing a certain amount to our endorsees over the two-year election cycle, ranging from $1,800 to $50,000+. Leadership Committee Members are invited to dedicated programming at Bend the Arc’s national conference, monthly strategy sessions, and screening interviews with prospective endorsees. Should you wish to join the Leadership Committee, please get in touch with our Director of Bend the Arc Jewish Action PAC, Derek Pugh, at dpugh@bendthearc.us.